Five Sacred Hearts Academy students attended in the University of Hawaii Cancer Center's Weinman Symposium on Friday, November 30, 2018. A special treat at the symposium included a keynote lecture given by Dr. Bruce Beutler, an American immunologist and geneticist and winner of the Nobel Prize in Physiology or Medicine in 2011. 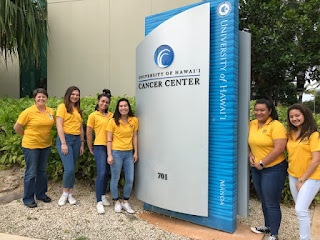 Following the symposium, the girls gathered with students from other schools for a special networking luncheon with numerous cancer researchers and Nobel Laureates hosted by the Cancer Center.